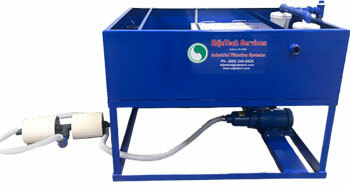 At EdjeTech, we offer the Tramp Oil Separator System (T.O.S.S.) that extends the life of your metalworking/metal forming fluids, and your detergent wash waters. This is accomplished through the removal of free-floating, dispersed, and loosely emulsified tramp oils from coolant reservoirs, or parts washers. How Does Our Tramp Oil Separator System Work? EdjeTech’s T.O.S.S. removes free-floating, mechanically dispersed (beaten in) oil, and suspended solids from contaminated fluid. The EdjeTech floating skimmer is mounted in the reservoir that contains the contaminated fluid (see picture on right). The floating skimmer is adjusted to skim the surface of the reservoir and pull in the free-oils that are floating on the surface. The skimmer also pulls in fluid beneath the surface that contains mechanically dispersed oil, and suspended solids. The separator supply pump pulls the contaminated fluid through the skimmer, and discharges it into a bag filter (see picture on right) located in the separator. The fluid filters through the bag, removing suspended solids, and flows under the tramp oil discharge trough into highly efficient coalescing media. The media is made up of one-cubic-foot cubes and contains 132 square feet of surface area. The large surface area is what allows for 99% separation efficiency of 20 micron oil droplets and larger on the first pass. The more area the tramp coolants have to flow through, the more efficient the water oil separator. The clarified fluid from the coalescing media flows into the clean fluid chamber and is discharged from the separator via an adjustable overflow weir and typically back into the reservoir from where it came. The free oils removed by the media surface to the top of the tank flow into the tramp oil removal trough where they gravity drain out of the system, and into a client-provided holding container (i.e. 5 gallon pail, 55 gallon drum). The operator only has to place the floating skimmer, and the T.O.S.S. clean-fluid return line in the fluid reservoir, then start the pump. The T.O.S.S. will do the rest. The T.O.S.S is perfect for use in metalworking facilities for turning, grinding and standard machining operations, as well as part washers. The process delivered by the T.O.S.S. is also applicable for coolant sumps in screw machine shops. Additional uses include pre-treatment before waste treatment systems and fine filtration systems, including micro, nano, ultra, and reverse osmosis. For more information about our Tramp Oil Separator system or to discuss your specific requirements, call us today at (800) 242-0525. "Yes, I would recommend EdjeTech Services to a friend, because of the outstanding service (anyone can sell you something but only someone who cares will sell you the right something)."